She picked up her broom and slipped it between her legs. “Magic broom, the moon is bright. 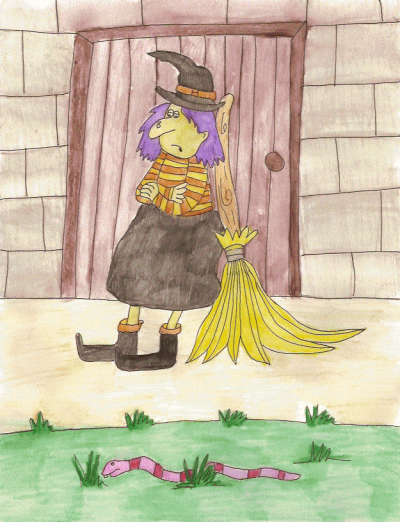 Magic broom we must go out tonight.” With that the broom shook from side to side and flew out of the window, with Alison holding on. Diane rode her broom along side of Alison. “It's fun. I love doing this. I died my hair a darker shade of purple today just for this occasion. You look like you need a touch up. Your skin is so pale. It hardly looks green at all. If you ask me, Alison, you're not much of a witch.” Diane sneered and flew toward the moon. Her cackles echoed across the midnight sky. She put on her hat, her boots and grabbed her broom. “Magic broom, the moon is bright. Magic broom, we must go out tonight.” Without hesitation, the broom whizzed out the window, heading straight for the moon. When Alison came closer to the other witches, she saw big chunks of cheese in their hands. “So that's why we fly across the moon every night. Witches like cheese and the moon is made of cheese. Now it all makes sense.” Alison flew right up to the moon. She picked up a chunk of cheese and gobbled it down. “This is good stuff. I like moon cheese.” All of a sudden Alison wanted to fly every night. She wanted cheese, like all the other witches. Never again did Alison stay home and nibble chocolate and sit in front of the fire. As soon as the moon came up, she was on her broom, heading for the moon!